We are currently raising funds to install concrete tee pads at Ship Rock DGC! We are offering three sponsorship levels (see below). If you or your business would like to donate, please contact us at shiprockdiscgolf@gmail.com. Also, if you know of any businesses who may be interested, please pass along this information. This goes a long way to being able to afford new pads and improve the park! - An Ace sponsorship is granted upon a donation of $800 or more. This sponsorship includes an 8.5 x 11 inch sign with a graphic for your business on a Tee Sign, solely for you. This sponsorship sign is maintained for 5 years. - An Eagle sponsorship is granted upon a donation of $300-799. This sponsorship includes a 5.5 x 8.5 inch sign with a graphic for your business a Tee Signs at Ship Rock, which is shared with another business who has chosen an Eagle Sponsorship. This sponsorship sign is maintained for 5 years. - A Birdie Sponsorship is granted upon a donation of $50-299. This sponsorship includes your name in the list of sponsors on the course overview sign. TO DONATE, please make checks out to Strasburg Township. On the memo line, write “SHIP ROCK SPONSOR”. 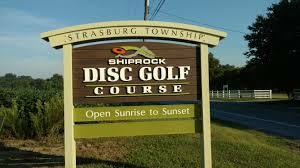 Note that Ship Rock Disc Golf Course is installed in Strasburg Township Park, and therefore all donations are tax deductible. If you donate, please email us for details about the graphic and the tax information. Additionally, individuals are welcome to donate any amount to the cause as well. Every little bit helps! Checks can be sent to Strasburg Township - 400 Bunker Hill Road, Strasburg, PA 17579. Cash donations can be given to Travis Dombach or Jon McDowell. If you have any questions regarding the sponsorship or want to get more involved, please send us an email. Come on out to Ship Rock for a 2-round PDGA C-Tier using the new Am Worlds layout on May 5th. Pros will be playing for cash. Amateur player packs by Discraft. Payout for all amateur divisions will be provided as credit vouchers to Lucky Disc Golf. Registration opens March 14th at 8p.m. at this link. Celebrate the New Year with LAFS at the 24th Annual New Year’s Day Nightmare at Roland Park in Akron, PA! 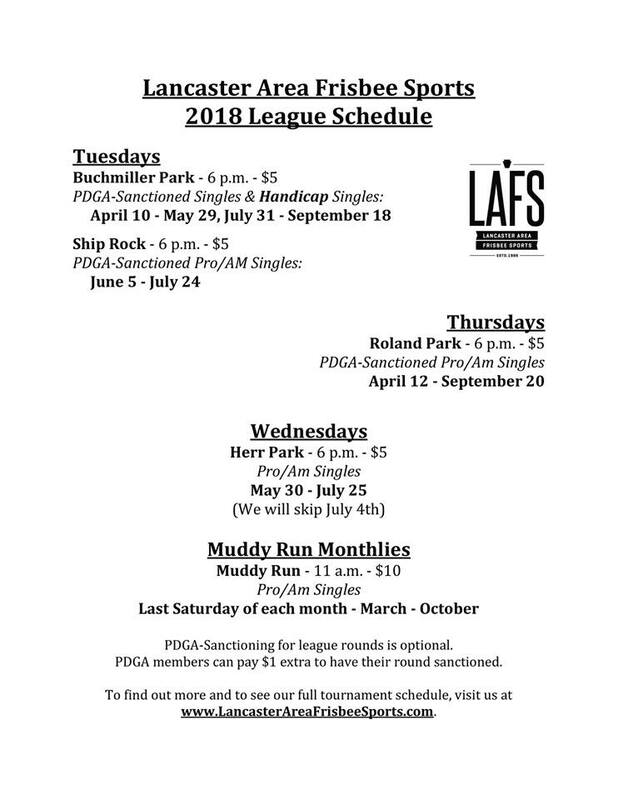 All players get disc of choice or 2019 LAFS membership with entry. Cash & prizes for top teams. If you don’t have a partner, you can play singles for the price of one, or pay the price of the team and play doubles by yourself. Or post in the LAFS Facebook group and ask, you won’t be the only one looking! We rented the Lion’s Club building by hole 11 and will have a pot luck lunch between rounds. Bring something to share. There are electric hookups for crock pots. Mark your calendars for Sunday September 23rd. 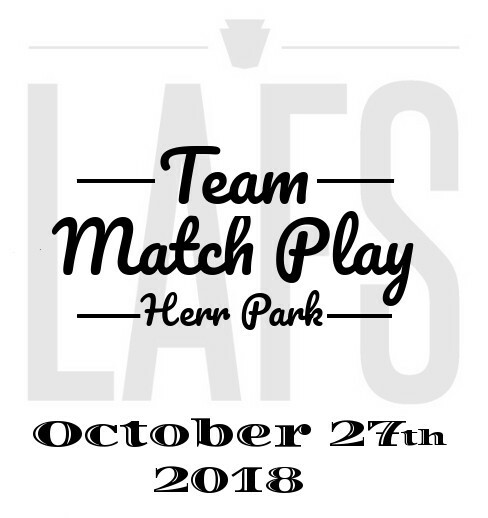 Herr Park DGC will host a doubles double-header! Proceeds from both will benefit York County Disc Golf club's new course at Kline's Run Park, south of Wrightsville. The MVP vs. Axiom Series is similar to the “Circuit Challenge”, but players can choose either an MVP or Axiom themed player pack. This offers players more options to strategize with and compete with new plastic. It is also a great way to introduce new player's to tournament play. Everything they need to play will be provided. Your $30 entry fee gets you a three discs (putter, midrange, and fairway driver) from the company of your choice plus an MVP drawstring bag. 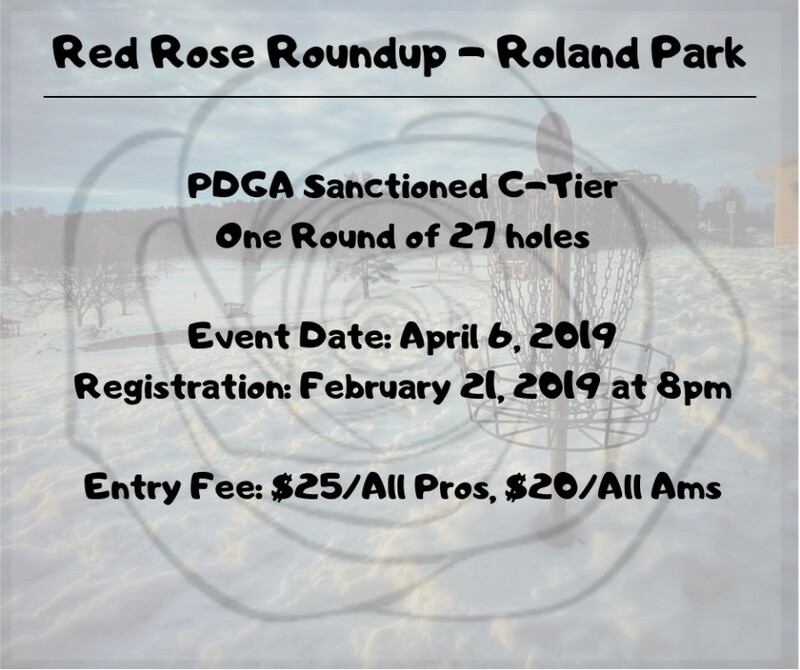 This is a PDGA-sanctioned event (XC Tier) that gives all you ams a chance to earn points to qualify for 2019 Am Worlds (to be held in York county & at Muddy Run. Low cost / high fun is the name of the game. You can play one or both events. Registration is open on DGScene. Sign up at https://www.discgolfscene.com/tournaments/Lebanon_Valley_Disc_Golf_Challenge_2018. It's time again for the Akron Summer Classic. Kick off the summer at Roland Park in Akron, PA on June 16 with this annual event. This PDGA C-Tier will test players in a variety of ways by including all 27 holes. First round will be 1-18, second will be 10-27. Both rounds will include Gold positions. Registration opens May 18 at 7:00 p.m. on DGScene. Sign up early to reserve your spot. This is a Road to Am Worlds Detour. Do you still need points to get into next year's Am Worlds event? Have you done your good deed yet for today? Knock out both of those things by signing up for this event. This will be a SANCTIONED XC TIER doubles event. No need to find a partner, we've got you covered. ALL players will be matched as follows- highest rated and lowest rated are a team, second highest rated and second lowest rated are a team, etc. For those who might worry about how this might affect your rating, XC tier events DO NOT COUNT towards ratings but they DO COUNT towards amateur point totals. All teams will be playing against each other in the Advanced Division which means that, assuming we fill the field, the winning team members will each get 360 points, second place will be 350 points, third = 340 points, etc. There is no bigger bang for your buck than this event, and you'll be doing a good deed at the same time. The player's pack will consist of a custom Ultimate disc. There will be an in round CTP for every card, as well as post round side games- long drive, putting contest, CTP, and raffle. All proceeds will be donated to the Pet Pantry of Lancaster County. Preregistration opens on May 27 at DGScene. PDGA C-Tier at Ship Rock DGC on May 27. 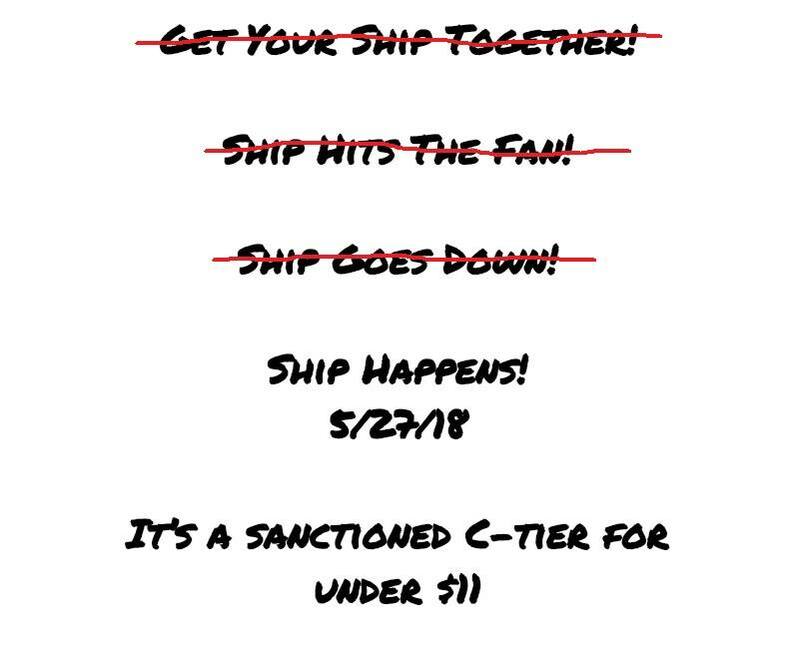 Another sanctioned C-tier for under $11? Really?? Yes, really. With everyone scrambling to earn enough points to qualify for Am Worlds, players need to save some money for the bigger A & B tiers but can still grab a significant number of points at this trophy only, amateur only, bargain basement C-tier. Additionally, if a non-PDGA player wants to test out the waters of competitive play, this will allow them to do so without breaking the bank. The official LAFS season starts on March 31! After our first Muddy Run Monthly (see below) we will start our weeklies with Warm Up Doubles at Buchmiller on April 3 & 5. $5 to play. A/B format. 6:00 start. After that, it will be singles. We will do 8 Tuesdays at Buch, then 8 at Ship Rock, then back to Buch for 8 more. Thursdays will be at Roland all season. We'll also have an 8-week Wednesday series at Herr this summer. And, for the first time ever, we will have a monthly series at Muddy Run, on the last Saturday of each month - starting March 31. For all of these league rounds, please arrive 10-15 minutes early to sign up. This helps us get started on time. The PDGA Amateur World Championships will be coming to Central PA in 2019. To help everyone accumulate the points needed to qualify, there will be a series of low-cost C-Tiers held throughout the season. The first is this Sunday, February 25, at Herr Park. This event is sold out. The second will be held at Roland Park on April 8. There are a few spots remaining. Sign up at here. Several more events are in the works at courses around the area. We'll post details as they become available.